The Terry Lakin Action fund is relieved that Barack Obama has begun the resolution of this longstanding and important Constitutional issue. Obama's actions are not surprising. The pressure was increasing as greater numbers of Americans began to question Obama's birth narrative. The controversy arose back in 2008 when an online document was widely portrayed as an original birth certificate. Only more recently were Americans informed by the Hawaiian Attorney General's office that Obama could not obtain a copy of his long form birth certificate. Then today, Mr. Obama produces yet another online document, a long form birth certificate. After more than two years of concealment and obfuscation, this document must be submitted for forensics testing to determine its authenticity. Similarly, the Kenyan birth certificate that has been widely circulating on the internet and on Capitol Hill-- should be tested. Had the Obama administration agreed to allow the document unveiled today and other related documents as requested for discovery in Terry Lakin's first pre-trial hearing, the matter would have been resolved and soldiers assured their military orders were lawful, given by a lawful Commander-in-Chief. Instead, all discovery was denied for two pre-trials and the court martial itself. This document which was so casually dropped on the news corps could just have easily been provided twelve months ago or two years ago. Even six months ago, it would have prevented LTC Lakin being manacled and hauled away to Fort Leavenworth prison for standing up for the Constitution, consistent with the oath he took as an officer, and the rule of law. We encourage the Obama administration to continue to be forthcoming with documents and other confirmations of the high standards for Constitutional eligibility. This document, and other ones which remain concealed, could have been presented last year. The Terry Lakin Action Fund is calling for a full and complete presidential pardon for LTC Terry Lakin including restoration of pay, benefits, and service. 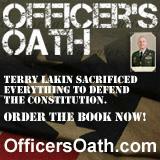 Terry holds no malice towards Barack Obama nor did he when he chose to bring the issue to a court martial. Terry simply wanted confirmation of Obama's eligibility, a process that has finally begun in earnest. NB: As of May 8, 2011, we have not heard from the White House.